When buying a table tennis table you need to know which table top you will require for your game. It is important you know the best from the rest with our helpful tips. What is a good table tennis table? You can tell by the thickness of the table top. 22mm or 25mm tables are the best. They offer a superb ball bounce, faster rallies and will last longer. 25mm table tops are the competition standard. 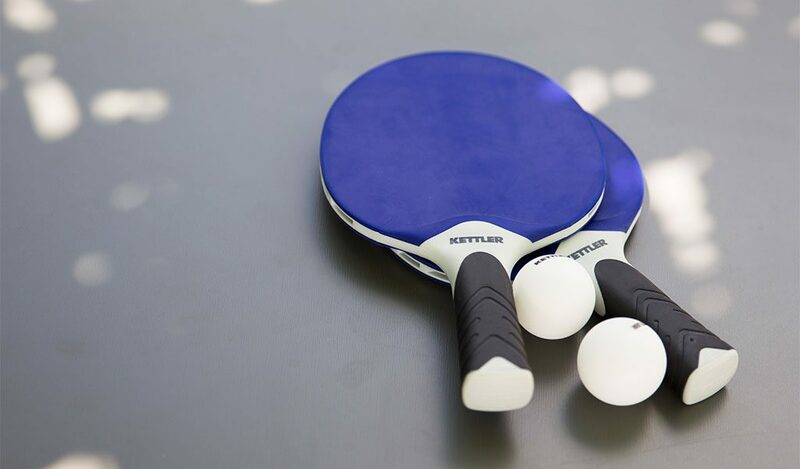 19mm table tops are an affordable choice for people looking to have fun playing ping pong with family and friends. This will give a good ball bounce, allowing amateurs to enjoy a steady rally. Any table tennis tops thinner than 19mm are much cheaper but are noticeably different to the more expensive tables. Balls do not bounce as high, and the top won’t last as long. 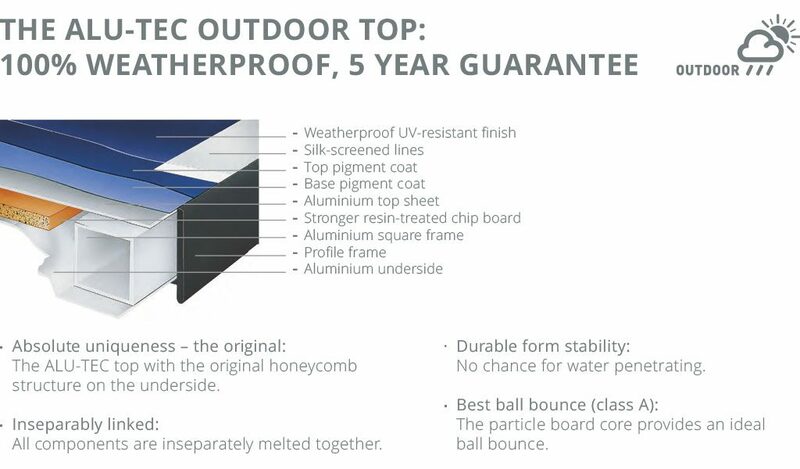 Kettler’s own Alu-Tec Tops for Outdoor Table Tennis tables are 100% waterproof and UV resistant. The wood top ensures the ball bounce is at its best while an aluminium underside gives the table added durability. The aluminium is rustproof with a honeycomb structure. Indoor table tennis table tops are different to outdoor table tops. They don’t require a waterproof lining or the metal underside. Our indoor table tops use specially treated wood covered with a pigment coat giving it its colour. We always recommend keeping an indoor table tennis table in a heated, dry room. They are not designed to go outside, in a garage or outhouse. Improve your table tennis skills by using playback or solo play. Many table tennis tables allow you to fold up one half which will then return the ball to you once hit against it. It’s good for improving agility and practising different return strokes. Solo play is also better for people who live with others who aren’t as enthusiastic about table tennis as you are. Simply fold the table up and serve. The thicker the table tennis top, the more expensive it is. The 22mm table tops will cost around £600-£700. An outdoor table tennis table will cost more due to the extra materials needed to keep it waterproof. The standard competition size for a table tennis table is 152.5x274cm. When buying an indoor table tennis table, always measure the size of the room and allow for 2 metres each way for you to move during each shot.